The wait is over as the most awaited fantasy TV series Game of Thrones season 8 or GoT 8 episode 1 titled “Winter Is Here" has been premiered. Well, thousands of GoT fans in India had set the alarm for 6:30 am on Monday to watch the most awaited drama series’ first episode of the final season. However, those who haven’t watched the episode yet, the GoT 8 1st episode has been leaked online just a few hours after its official release. The very first episode Game of Thrones season 8 is available in HD quality on Torrent website and viewers are downloading it. However, this is not the first case of leak or piracy of Game of Thrones Tv series episodes online before or after its official release. Though the security for the season eight was high as it is also a final season and its leak would strongly affect makers. According to reports, the Game of Thrones cast and crew also had no idea about the ending of the show. In an interview, the GoT actors have also revealed that hey had to use a special mobile application to access the script. Later, the script used to get deleted automatically. However, even after taking such steps to prevent it from piracy, though it had made its way online and now Indian fans are freaking out for what they have seen online. 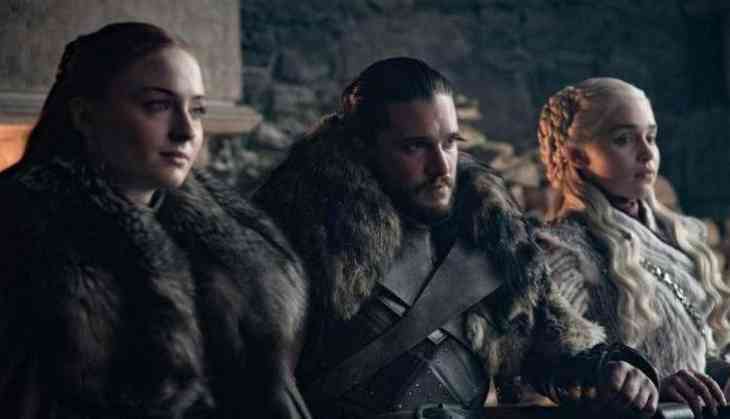 The first episode of Game of Thrones season 8 stars Jon Snow and Daenerys Targaryen coming to Winterfell, where Sansa Stark greets them. Jon Snow will meet Arya Stark in Old Gods. The first episode is a reunion of Starks. No spoilers ahead from our side.